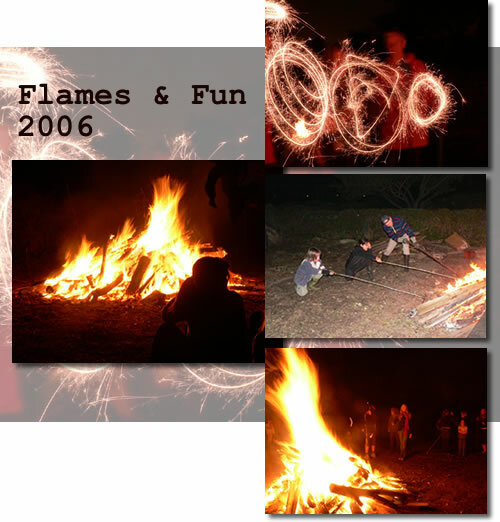 Bonfire Night 2006 in the Shared Gardens was again a wonderful display of warmth and friendship. People from all over the globe were here to celebrate. Ian and Andy T came to build the fire in the middle of allotment 2, which was lit at around 4.30pm. Jola prepared the lanterns to hang in the trees and Karina sorted out some of the ornamental gourd decorations and a harvest display. Some of the older boys and girls, helped sort out the lighting along the paths, the gazebo, class room and greenhouse by placing tealights in jam jars. Simple but very effective! A gazebo decorated with candles and decked with wonderful homemade food, was positioned strategically in allotment 1, so that one could sit and watch through the apple trees and soak up the atmosphere. Children were playing, Sparklers were lit, marshmellows roasted and long bamboo sticks and in the classroom, more hot soup and a lovely spread of breads and cakes were beckoning people to come and savour the delights. Although an evening like this is a superb social event, it also serves as our once a year clearing of wood and hedge cuttings activity. As yet, we have tidied a lot but hopefully the ambers will still be hot enough to finish off the last of the hedge cutting and burning tomorrow, leaving our allotments clean and tidy for the winter.